MidAtlantic Bulldog Rescue was contacted in early March by a rescue volunteer in Baton Rouge, Louisiana. 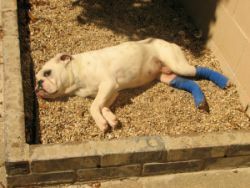 A young male bulldog had been brought into the shelter; his back legs had been bound up and tied with wire. The injuries to his legs were very severe and the shelter did not have the ability care for him long term and no rescue group would take him in. He had no name; when we saw this picture and realized he was living outside with those bandages, we knew he needed our help, and fast. We made a few calls and had some options on transportation, but due to the extent of his injuries, we felt it best that we make the drive ourselves to bring him to New Jersey. Joanne Hale & Cathy Kittell agreed to split the cost of the trip. A route was planned, bags packed and they left on Thursday, March 14th. ?Joanne & Cathy drove 19 hours to Meridian, Mississippi to meet up with Trish Brumfield, the bulldog rescue volunteer from Louisiana. Trish had driven 5 hours from Baton Rouge, Louisiana, to meet up with Cathy & Joanne. In addition, Trish had asked we find a home for a sweet 5 year old female also. ?The moment Cathy & Joanne saw this dog, they knew they made the right decision in driving to get him. They were calling him “Petey”; he was barely 37lbs., had a serious ear infection and both legs were bandaged. ?The veterinarian at the East Baton Rouge Animal Shelter did a fantastic job with limited resources. ?It didn’t take long for the two sweet bulldogs to settle in for the long ride back to New Jersey. Joanne & Cathy agreed that since “Petey” was starting a new life in New Jersey, he needed a new name. They decided on “Louie”. As you can see, Louie made himself quite at home on the trip back. He probably hadn’t felt a soft warm blanket in a very long time. Joanne & Cathy returned to New Jersey on Sunday, March 16th. On Monday Louie went to see Dr. Keefe, a wonderful veterinarian who works with most of MidAtlantic Bulldog Rescue’s bulldogs. Dr. Keefe spent over an hour and a half with Louie & Joanne. 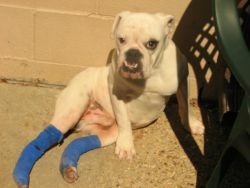 The vets from down south were afraid Louie had broken bones and severed tendons. Luckily, Louie’s tendons and bones are just fine. Dr. Keefe removed the bandages, scrubbed and cleaned the wounds and showed Joanne how to take care of the wounds. 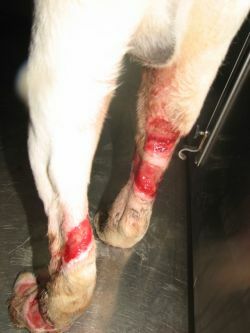 Louie’s wounds needs to be irrigated, cleaned and medicated everyday. The stitches from his neutering and leg surgery will be removed in a week and x-rays will be taken to see how Louie’s bones are progressing. Louie also has kennel cough, he is on antibiotics and pain medication. For all that this sweet boy has been through, he has never so much as growled or whimpered. When his wounds were being cleaned, he licked Dr. Keefe’s hands. He will roll over and his tail wags with joy for a belly rub. Dr. Keefe has been phenomenal in the care and interest he has taken in Louie. We can not thank him enough for his kind heart and gentle ways. Louie will need additional surgery on his one leg and that will be done in a few weeks. This little guy is an absolute joy; his fur is soft as velvet and his eyes are soulful, he talks to you with them. Louie will rest his head on your lap and just wants to be petted and loved. He has stolen the heart of everyone who has met him. Update!! Louie has been adopted!! We at MidAtlantic Bulldog Rescue would first like to thank everyone for their generous donations and emails regarding Louie. This sweet boy has come a long way in his recovery. From the early days at the shelter to the present time Louie is like a different dog. His legs are healing nicely but he is still under our vets care. His one foot is still a bit of a problem with some infection but the other leg is healing nicely. He will always carry the scars on his leg of someone’s cruel treatment. This little man’s sweet personality has really blossomed. He is affectionate, loving and quite the little clown. Louie loves to have his belly rubbed, to play with toys and other dogs. He really loves his snacks! Louie has gained almost 10 pounds from the time we brought him back from Louisiana. Louie has found his forever home. He was adopted by one of our volunteers, who recently lost her beloved 10 year old bulldog to cancer. Her heart was broken and from the time she first laid eyes on Louie she knew they were meant to be together. Louie to heal her heart and she to heal Louie’s wounds and to give him the love and kindness he has never known. They have been together for a few weeks and Louie has settled in quite nicely. They are certainly quite a team. Louie will be visiting our vet in the next week to see what the next step in his healing process. Thank you again from all the volunteers at MidAtlantic Bulldog Rescue for all the help we have received. Without the kindness and generosity of so many wonderful people we would not have been able to provide Louie with the care he needed. Louie had his own story in The Advocate! All it took for two New Jersey animal lovers to pack up their Dodge Caravan and drive across the country was seeing a picture of Petey, the English Bulldog. 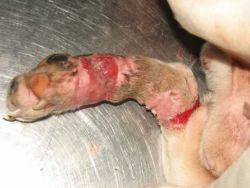 I’ve nursed back some sick dogs but have never seen anything like this”, said Joanne Hale, of MidAtlantic Bulldog Rescue. “We will do whatever it takes so that he gets the care he needs”. Petey had been dropped off at the East Baton Rouge Parish Animal Control Center on Feb. 25 by a woman who found the dog with a nylon wire wrapped around his hind legs, said Hilton Cole, director of the center. The wire cut Petey’s skin and muscle to the tendon and bone, said Dr. Marianne Fairchild, a veterinarian who works and volunteers at the center. The wire also cut off his circulation, causing his feet to swell to twice their size in some areas and to four times in other areas. The wire was most likely from a dog runner, a device dog owners set up in their yards that allow their pets to move around without running away, Fairchild said. Petey probably got loose and ran off with the wire still attached to him. The rest of Petey’s treatment, however, will be in New Jersey instead of Louisiana. 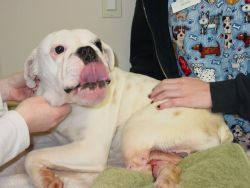 Neither the Animal Control Center nor Louisiana Bulldog Rescue have the resources to continue Petey’s care. Trish Brumfield, a volunteer with Louisiana Bulldog Rescue, contacted several rescue organizations across the country to see if they could take Petey. Hale and her rescue partner, Cathy Kittell, said yes and met Brumfield in Meridian, Miss., on Friday to pick up Petey and another English Bulldog in need. Hale and Kittell said the 16-hour trip was the longest they’ve taken to rescue a dog. The women started Mid-Atlantic Bulldog Rescue in October, but have been taking in stray dogs for the past decade. Hale said Petey will meet with a veterinarian Monday and, if necessary, a specialist. He also has a prospective home, she said. The wife of a veterinarian who helps the MidAtlantic Rescue organization is interested in making him her pet. Brumfield called Hale and Kittell angels.